All great content starts with a documented content strategy. But too often, businesses skip the planning stages and jump right into creating content. Although this might work for a little bit, it often leads to content that doesn’t have a focus, isn’t targeting your buyer personas or isn’t published on a consistent basis. It’s one thing to know having a content strategy important, but it’s another to know how to create one. So, if you’ve ever wondered how to create a content strategy for your business and what elements go into it, we’ve got you covered. A content strategy is your vision for all your content marketing efforts – the ins and outs of how your content will be created, managed and eventually archived or updated. Your strategy provides you with a roadmap to consistently create valuable, engaging and helpful content that attracts the right visitors, converts them into leads and closes them into customers. A strategic plan gives your content purpose – a “why” – and serves as a roadmap for how you’ll achieve your content marketing goals. Everyone on the marketing team agrees that content marketing is important, useful and a good idea for the business. But then the question remains: Who will manage creating the content? One of the team members (we’ll call him John) raises his hand and says he’ll give it a shot. So, John goes back to his desk and spends a good part of the day writing a blog post. Once he’s finished, he shares the blog with the rest of the team. Everyone weighs in and makes suggestions on how to make it better. The next day, John spends a few hours making those edits. Now the blog post is ready to publish. Hooray! Now, it’s onto the next blog, and John knows he’s going to spend at least half his day writing. But the company is also preparing for a super important trade show, and the marketing team needs all hands on deck to get everything ready. So, John puts the blog post on hold until next week. The next week arrives, and Nancy is on vacation, which leaves John to cover for her and pick up some of the extra work – meaning he won’t have time to write the blog post this week. And before you know it, several months go by without any more blogs being published. It’s a common scenario for many businesses. The lack of a clear, documented strategy means you’re at best inefficient in consistently publishing new content. At worst, you risk producing the wrong content (i.e. content that doesn’t help you achieve your business goals) or you’re not producing content at all. Although 92% of businesses view content as a critical business asset, only 30% see their content marketing as effective. Managing content is a challenge for many marketing teams. With so many moving pieces – from what to write about, to who will write it, to what to do after you hit “publish” – it’s easy for content creation to get lost in the shuffle of other marketing tasks. Although 92% of businesses view content as a critical business asset, only 30% see their content marketing as effective. And that may have something to do with the fact that only 46% of marketers have a documented strategy in place. More likely to consider themselves effective* at content marketing. 60% of businesses with a documented content strategy consider their organization to be effective at content marketing. 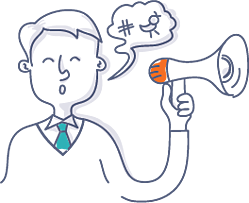 In comparison, only 32% of businesses with a verbal strategy say they’re effective. The lesson? If you want to be more effective at content marketing, take the time to document your strategy and follow it as much as possible. Less challenged with every aspect of content marketing. 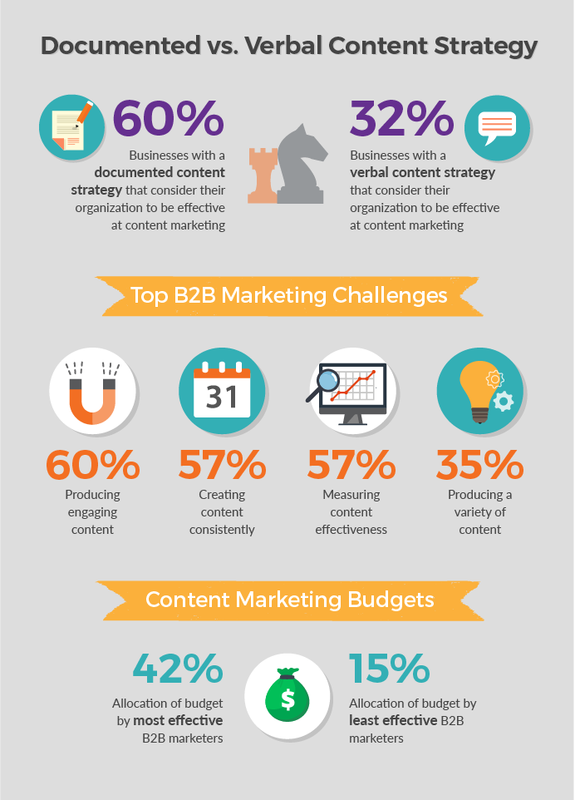 The top challenges B2B marketers face include producing engaging content (60%), creating content consistently (57%), measuring content effectiveness (57%) and producing a variety of content (35%). Companies with a documented strategy found it easier overall to create content and create it consistently, since they had a plan in place to guide their efforts. And 55% of B2B companies with a documented strategy publish content either daily or multiple times per week. Able to justify a higher percentage of their marketing budget on content marketing. CMI found a correlation between effectiveness and the amount of budget allocated to content marketing. The most effective B2B marketers allocate 42% of their marketing budget to content marketing, whereas the least effective only allocate 15%. Guiding you in determining the types of content to create. By having a documented strategy, you’ll be able to remain focused on your ideal buyers, which enables you to create content they’ll want to read. Allowing you to plan and allocate the resources you’ll need to create content. A content strategy lets you see the big picture of all your content needs and helps you determine whether you can accomplish the entire plan with the resources you have or whether you’ll need to adjust your priorities, hire additional staff or hire an inbound marketing agency. Keeping you on schedule. Content marketing is a long-term play that requires consistency to be successful. But it’s easy to lose steam after the first month or two when you don’t have a documented strategy in place. Defining your strategy helps you see what you have planned and keeps you on track. Keeping you goal-focused by clearly defining what success looks like. This will prevent you from throwing resources at something that has no impact on revenue. Don’t make the mistake of trying to make everything up as you go along. If you’re going to invest in content marketing, set yourself up for success by taking the time to document your content strategy upfront. Your business has more competition than ever. According to Content Marketing Institute, 70% of B2B marketers created more content in 2017 than they did in 2016. If you want to get ahead of your competitors, it’s critical you have a content strategy in place. Ready to get started creating your content strategy? Here are the steps you’ll need to take. Setting goals is an important part of any content strategy. But goal setting is probably one of the hardest things a marketer must do. After all, you need to choose a goal that’s tough to achieve but isn’t so tough it’s impossible. Specific: Include real numbers and deadlines. Measurable: Make sure you can track your goal in some way. Attainable: Your goals should be challenging but still possible to achieve. Realistic: Be honest with yourself and make sure your goals are realistic for you and your team. Time-bound: Give yourself a deadline as to when you want to achieve your goals. We want to generate 50 new leads from our content marketing efforts between January 1 to March 31, 2018. We want to hit 5,000 visits from organic search in January 2018. We want to rank number one in Google for the keyword “fraud protection” by the end of June 2018. Setting SMART goals is about breaking down goals into measurable pieces. At the beginning of the process – before you make sure it meets the SMART goal criteria – think about the big picture goal you’re trying to achieve. One of the most challenging parts of setting SMART goals is setting that specific number you want to work toward. To help make the process easier, start by looking at your current data and trends. This will give you a better idea of where you are now, what’s achievable and how to make a plan for hitting your new goals. While everyone would love to see huge growth in a short period of time, do you have the time and resources needed to complete your goals within the time frame you selected? Remember: Be realistic about what you can achieve, but don’t give yourself too much time to get it done. Resist the urge to set goals in your head. Write everything down so you have a record of what goals you’re working toward and how you intend to achieve it. This helps ensure everyone on your team is on the same page and that they understand the goals and their purpose in your content strategy. In an ideal world, you’d set your SMART goals, everyone would start working toward those goals and you’d achieve them every single time. But as every marketer knows, nothing ever goes exactly according to plan. Think through some of the possible challenges your marketing team may face trying to achieve the goals you’ve set, and find ways to prevent or resolve them before they even come up. Don’t just set your goals and forget about them. At least once a month, take the time to track your progress. The data you’ll want to review depends on the goals you’ve set, but don’t overthink it. For example, if your goal is to hit 10,000 visits from organic search in Q1 of 2018, look at how much traffic is coming in from organic search every month. Recording this data will help you see whether you’re on track to achieve your goals, but just as important, it’ll help you set better goals in the future. As you continue to work toward your SMART goals, remember to communicate with the rest of the team. Let everyone know what challenges you’re experiencing and what milestones you’ve hit – and make sure everyone else on the team is comfortable doing the same. Goal setting isn’t an easy process, and you’ll likely find yourself re-visiting and tweaking goals as you go. That’s okay. Your goals don’t need to be perfect the first time. The idea is to figure out where you want to go, get something down on paper and work toward it. Helpful Tool: Our SMART goals template will help get you started! Before you start creating content, it’s important you understand the people you’re creating content for. And the best way to do this is to create buyer personas. A buyer persona is a semi-fictional representation of your ideal customer based on market research and real data about your existing customers. When creating buyer personas, you’ll want to include information such as demographics, industry, job role, goals, challenges decision making factors, where they go for information and more. To create strong buyer personas, we recommend you start by talking to people within your own company. Talk to your sales reps, customer service reps and account managers – the people who are on the front lines dealing with customers every day. They’ve heard everything – their most pressing questions, their biggest challenges and what prevents them from making a purchase decision – and they’ll have a good sense of your ideal customer’s pain points and questions. What questions from prospects or customers do you encounter most often? What makes prospects or customers happiest? Why do you think that is? What frustrates prospects or customers? Why do you think that is? Not only will these internal interviews help you learn more about the questions and pain points your content needs to address, it also lets your team know they’re critical to the process of creating buyer personas. This gives everyone a stake in the game and ensures everyone is on the same page with your marketing efforts. Once you’ve completed the internal interviews, it’s time to start interviewing your customers. Keep in mind, though, you’re not looking for testimonials. You’re looking for the thoughts and motivations that led them to find and choose your company. This means you need to ask the right questions. Only scratch the surface, and you’ll end up with overly general personas that don’t give you a true picture of your ideal customer. Dig too deep, and you’ll get an overly specific profile that’s difficult to project across more than that one client. For every persona you create, try to interview at least three to five people – although you may need to interview more. It all depends on how much you know about your persona to begin with and how much information you gather during your interviews. For every persona you create, try to interview at least three to five people. A general rule to follow is this: When you’re able to start accurately predicting what your interviewee is going to say, it’s probably time to stop. Through your buyer persona interviews, you’re going to start noticing some patterns. And once you start expecting and predicting what your interviewee is going to say, that means you’ve interviewed enough people to find these patterns. Depending on your business, you could have as few as one or two personas or as many as 10 to 20. But, three to five is usually a good place to start. Remember: You can always develop more personas later if needed. Helpful Tool: Use this buyer persona template for examples! Given that most B2B buyers do more than half of their research online before ever reaching out to a company’s sales team, knowing what your prospects are searching for and what questions they have is critical to your content’s success. This is where mapping the buyer’s journey comes in. Mapping the buyer’s journey adds an extra layer to your buyer personas, and it helps you align your content with the questions a prospect has through each distinct stage of the buyer’s journey: awareness, consideration and decision. In the awareness stage, a buyer is experiencing and expressing symptoms of a problem, and they’re doing educational research to help them more clearly understand their problem. When creating content for the awareness stage, focus on the buyer’s pain points – not your product or brand. The goal is to educate your audience and answer their questions. Common awareness stage content includes blogs, e-books, white papers, tip sheets, guides, infographics and slideshares. The buyer now has a clear idea of what their problem is, and they’re committed to researching and understanding all the available approaches to solve their problem. During this time, a buyer will also start to compare the different approaches they can take to solve their problem. When creating consideration stage content, focus on making it solutions-oriented. In other words, how can a specific solution make the buyer’s life easier or solve their problem? 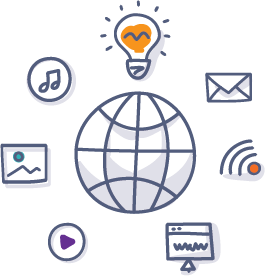 Common consideration stage content includes more technical blog posts, comparison white papers or e-books, webinars and product feature videos. In the decision stage, the buyer has decided on their solution strategy, and they’re compiling a list of all the products or vendors that can solve their problem. Ultimately, they’re doing research to make a final purchase decision. Now is the time to create content that’s brand-specific and focuses on your product or service. 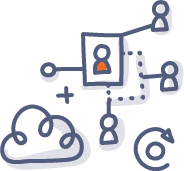 Common decision stage content includes case studies, testimonials, vendor/product/pricing comparisons, live demonstrations and free trials. As a buyer moves through each stage of the buyer’s journey, his or her questions and needs change. A good content strategy answers questions at every stage of the buyer’s journey and provides a roadmap for how you’ll do it. This ensures you’re always ready to answer a buyer’s next question until they’re ready to make a purchase decision – and hopefully buy from you. 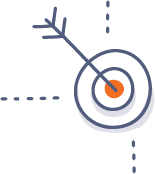 Helpful Tool: HubSpot provides terrific guidance with this buyer's journey template! Once you know who you’re talking to, you’ll need to determine how you talk to them. Every successful brand has their own unique style and personality. Just take HubSpot, MailChimp and Buffer for example. Each of these companies operates in a similar market, but each has its own style that differentiates their approaches to content marketing. And creating this memorable, distinct style all starts with voice and tone. Voice and tone are the backbones of your brand’s personality and should never be an accident. Developing a strong voice and tone needs to be something you constantly work toward because consistency is memorable. Voice and tone help you create a powerful, unforgettable brand your audience will connect with. This is your brand personality described in adjectives – the attributes that your ideal customer uses to describe you. Voice should be consistent across all your marketing. This is how your brand sounds and how your brand personality manifests in a piece of content. Unlike voice, tone is dynamic and may change based on the buyer persona you’re targeting, the type of content you’re creating or the message you’re delivering. Essentially, your brand has one voice but multiple tones that shape your voice in different content scenarios. Once you’ve defined your brand voice and tone, it’s time to formalize it in a content style guide. Always keep your buyer personas in mind when creating your brand voice and tone. For example, you may want to sound modern and fun, but maybe your personas respond to content that’s straightforward and professional. If you want to create content that resonates with your audience, you need to focus on writing in a voice that speaks to them – even if it’s not what you’d want. Once you’ve defined your brand voice and tone, it’s time to formalize it in a content style guide. A content style guide is a document that helps everyone in your organization understand who your brand is and how it’s expressed through copy. It doesn’t need to be fancy or elaborate, but it should be documented in some way so everyone can use it. Helpful Tool: Need some inspiration? Check out the voice and tone section of MailChimp’s content style guide. An important – but often overlooked – step in creating your content marketing strategy is conducting a content audit, which is an in-depth look at the content you’ve already created. Now, you could spend a few hours looking through your site, reading some content and forming opinions based on what stood out to you. But a loosely structured content audit won’t give you the whole picture. To really understand the quality of the content on your website, you need to assess each page with a set of standard metrics. To start your content audit, take an inventory of the existing content on your website. You can do this manually if you have a small site or you can use a tool like Screaming Frog to pull the full list of URLs from your site. What is the content about? Does it talk about your product or service, or is it more educational? Come up with a list of broad categories that summarize the topics you’ve covered in your content, and assign each piece to a category or two. This will help you draw conclusions about what topics your audience is most interested in. How long is the piece? And does the word count affect how it’s viewed and shared by your audience? Do your personas prefer longer, more comprehensive pieces of content, or do they prefer shorter pieces they can quickly digest? What stage of the buyer’s journey does each piece of content fall into – awareness, consideration or decision? What’s the tone of each piece of content? Conversational? Professional? Persuasive? Come up with a few adjectives that describe the tone of your content pieces. How relevant is a topic to what your business actually does? Does it talk about your audience’s pain points? Or is it something that’s only loosely relevant to your business? Create a scale, and determine where each piece of content falls on that scale. Some content is evergreen and lasts forever, while other content is tied to current events. Again, create a scale, and decide where each piece sits on that scale. Is the piece properly optimized for SEO? Does it have a designated keyword, meta description, title tag, headings throughout and image alt text? Write down each of these pieces, and make a note if something is missing. Does the post feature any additional content like embedded videos, lots of imagery or an infographic? Congratulations – the tedious part of conducting a content audit is done. Now for the fun part: analyzing the data! As you sort through the data, look for trends. For example, are all your best-performing blogs about a specific topic? Are your highest converting blogs a certain length? Don’t forget to identify the gaps in your content as well. Maybe you find that most of your content falls in the awareness stage of the buyer’s journey and that you don’t really have a ton of consideration or decision stage content. Or, you may find that you don’t have a lot of content on certain topics. Conducting a content audit takes some time, but it’s well worth the effort – especially as you get ready to build out your strategy and brainstorm new content ideas. 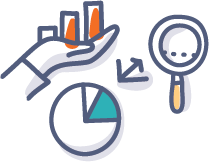 Helpful Tool: Our content audit template walks you through this process and helps you organize your results! Great content ideas are at the heart of any content strategy. Sometimes, though, finding the right ideas is a daunting task – but it doesn’t have to be. If you aren’t already keeping a folder of ideas, images, approaches, content pieces and technologies that inspire you, start now. Look to this file whenever you need inspiration for a new project. A swipe file can take any form that works for you: a Dropbox or Google Drive folder, email folder, app, Pinterest board, Trello card, Evernote, etc. A successful brainstorming session can help you generate a ton of new content ideas. But the key is doing it right. Keep the participants to a minimum. This isn’t to say you can’t have a 10-person brainstorming session. But, if you do, break up into groups of five or fewer for the initial brainstorming then report back to the group afterward. Involve the whole company. Sometimes, it’s helpful to include people who aren’t familiar with the project because they’ll come in with fresh ideas. 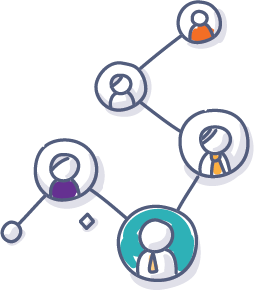 Include everyone on your team – from marketers, designers and web developers to sales reps, account managers and executives. Keep the ideas open. When you first start a brainstorming session, no ideas are bad ideas. So, even if someone presents an idea that doesn’t sound like it would work, avoid saying “no” to their idea. Instead, find a way to recognize the validity of each idea and see if there’s a way you can incorporate it into your strategy. Record everything. If you’re doing the meeting virtually via a video chat, record the call. If you’re holding it in person, write every idea down on a whiteboard or piece of paper, and take a picture so everyone has access to it. It’s important to read your competitors’ content on a regular basis and watch for what you think works and what doesn’t. We know it sounds strange, but trust us, keeping an eye on your competitors only helps you create better content. It’s easy to look at one of your competitors’ highest performing blogs and think, “I’m going to write a post on the same exact topic, but I’ll do it better.” And while you might have success with that tactic for a short time, in the long-term, you’ll only fall behind. A better way to build successful content is to use the inspiration as a jumping off point for your own content ideas. If you’re stuck, the next way to come up with new content ideas should help. Sometimes, generating new content ideas is about looking at a topic from a new angle. Look back at old topics that performed well (or, look at what your competitors are doing), and think of creative new ways to talk about the same topic. To do this, explore secondary relationships and related phrases or keywords. When doing keyword research, use your buyer personas and the buyer’s journey as a guide. What topics are most relevant to your personas? What do they want to learn more about? What are their challenges? Use these questions as a jumping off point. Start plugging them into Google, and see what search terms and phrases pop up frequently. Then, use these keywords as the basis for new topics. Choose content ideas that are most relevant to your personas. As you’re brainstorming and building out new content topics, it’s important to find a balance between timely content (based around current news within your industry) and those that are evergreen and will stay relevant for a long time. Once you have a list of new content ideas, it’s time to sort through them and find the ones that are most relevant to your personas. Look for ideas that are both impactful and relevant. Think about what will interest your personas, what will answer their questions and what will solve their problems. Then, back it up with some good old-fashioned keyword research. Helpful Tool: This HubSpot article contains an incredibly helpful content brainstorming spreadsheet to help you translate a general topic into actionable content ideas. One of the reasons you start the content strategy process by creating buyer personas is because they help you determine the kind of content your audience likes and wants. Spend most of your time and effort creating this type of content. However, that doesn’t mean you’re automatically limited in the types of content you can create, though. The most successful marketers use on average 15 different approaches, according to Content Marketing Institute. Save room in your strategy to experiment with different types of content, and you might be surprised to find a new approach that works exceptionally well for you. This is the most popular type of content for businesses. Blogs should provide valuable content for your audience, answer their most pressing questions and address their pain points. We recommend blog posts be at least 1,000 words – since posts of this length generally perform better, get more social shares and are more likely to show up in search results. However, it’s important to experiment and see what works best for your audience. White papers and ebooks are great lead generation tools that potential customers can download by filling out a form with their contact information. They’re typically longer, more in-depth and published less frequently than blogs. Case studies help showcase how your product or service has been successfully implemented by other companies. When done right, case studies allow you to showcase your successes in a way that makes a prospect want to become an actual customer. Templates, although often underutilized, are a great content format because they help generate new leads for your business while providing tremendous value to your audience. These are just the beginning. 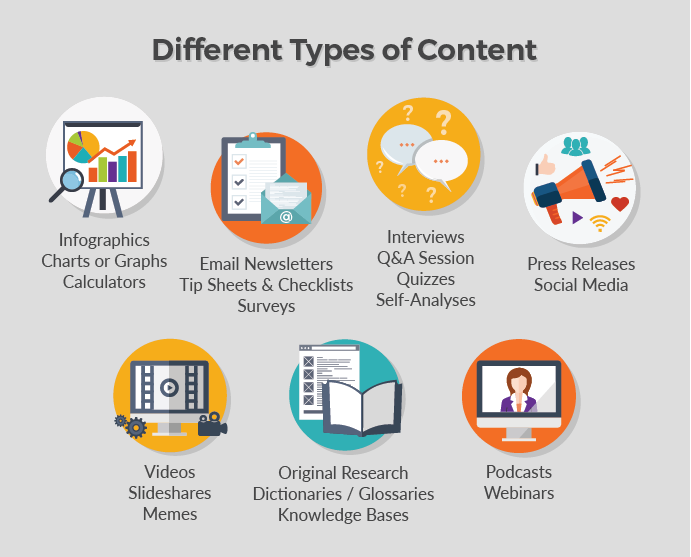 There are tons of different content types you can leverage on your website. Helpful Tool: Use this Our blog post templates give you eight ready-to-use examples to help put some structure to your ideas! If you want to be successful at content marketing, it’s critical you take the time to document your strategy. Part of what makes a documented strategy so powerful is that everyone on your team – from marketing managers to senior-level directors – can see what your company is working on and how you’re communicating with your audience. This alignment within your organization makes it easier to get buy-in from executive team members and get other people within your company involved with creating content. To get started, create a document that outlines your entire content strategy – including goals, buyer personas, the buyer’s journey, voice and tone, keyword research, content ideas and the types of content you’ll create. This can be in the form of a Word document, Google Doc, Evernote or something else altogether. Just make sure everyone in your company has access to it. Easily repurpose topics and content in the future. You can create editorial calendars on a monthly, quarterly or even yearly basis – although we’ve found that quarterly works best for our clients. As you complete this documentation process, remember: Your content marketing strategy (including the editorial calendar) is a living, breathing thing. Nothing is set in stone. While you should try to stick to the plan as much as possible, being flexible will benefit you tremendously when you realize that one of your blog topics isn’t a great fit for your personas or a goal you set isn’t achievable this quarter. Don’t be afraid to change things as you go if needed. Once your strategy is complete, it’s time to put it into action! What’s your team’s bandwidth for creating and promoting content? What resources will you need to implement your strategy? 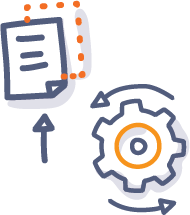 What software, systems and other technology (like project management tools or a CRM) will you need to develop and publish your content? Who will create the content? Who will review it? Which stakeholders need to give feedback before a piece of content is published? Who will design content offers? Who will publish it? What’s your strategy for promoting content? Will you share it on social media? Send out email newsletters? Promote via paid advertising? Your content marketing strategy is a living, breathing thing. Don't be afraid to change things as you go if needed. As you can see, there are a lot of moving pieces to manage. Taking the time now to think about what you’ll need, who will do what and next steps for your content will benefit your business greatly in the long run. Now, it’s one thing to have a plan, but it’s another to actually stick to that plan and stay on top of creating new content. Too often, businesses excitedly start creating content, keep up with it for a few weeks or months and then stop. If you’re working on your own, you could get by with just a list of tasks in your notebook – but we don’t recommend it. Whether you’re a marketing team of one or 20, invest in a project management tool and use it to set up and manage your tasks. There are plenty of great tools out there, but some of the more popular ones include Teamwork, Basecamp, Trello, JIRA and Asana. For your content strategy to be effective, it’s important everyone knows who’s responsible for each task. Unless you and your team know who’s working on what, you could find that people miss their deadlines or tasks are forgotten about altogether. This is where having a project management tool really makes a difference. But just putting tasks into your project management software isn’t enough. Sit down with your team on a regular basis to ensure everyone has a clear idea of what tasks they’re responsible for and how they can meet their goals. To ensure tasks get done on time and in an orderly fashion, rank projects by urgency and set deadlines accordingly. Deadlines help keep everyone on your team on track and allow you to see what projects are on or behind schedule. While it’s tempting to jump right in and start everything right away, you’ll find yourself quickly overwhelmed if you try to create too much new content at once. Make a list of everything you want to accomplish in your content strategy, then rank each tactic from highest to lowest priority. When ranking your tactics, think about what will benefit your personas the most and what will provide your business with the highest ROI. Those are the tactics you’ll want to start with. Depending on the size of your team, your background and your bandwidth, you may not be able to handle all this content on your own. Working with an inbound marketing agency to plan, create and execute your content strategy is often beneficial as it will take some of the workload off you and your team. No one likes to do a task just for the sake of doing it. Every task and tactic should have a clear link back to your overall goals and content marketing strategy. And be sure that your team knows why tasks are important by communicating these goals with them. Creating content consistently all starts with setting your business up for success. By taking these steps to become more organized, you’ll find that it’s much easier for everyone on your team to continually create new content. Helpful Tool: Download our editorial calendar template to help you document your content timeline! Measurement is a key area where marketers struggle. In fact, only 21% of B2B marketers say they’re successful at measuring content marketing ROI. Content marketing ROI is the percentage that shows how much revenue you gained from content marketing in comparison to what you’ve spent. And for many businesses, ROI is the most important measure of success because it’s directly tied to revenue. Attribution can be difficult. For example, how do you determine whether it was a case study or sales rep’s follow-up call that converted a customer? Some content marketing activities like brand awareness, recognition as a thought leader and increased customer happiness are challenging – if not impossible – to put a dollar value on. Much of the content you’ll create is top-of-the-funnel content, meaning it’s used to build awareness and educate your audience. To determine which metrics to track, go back to your goals. Even though showing the ROI can be difficult, it’s not impossible to see what’s working for your business and what’s not. To get a better sense of how your content is performing, run analytics reports at least once a quarter. However, it’s often beneficial to track results every month since this gives you a better overall picture of your results. To determine which metrics to track, go back to your goals. For example, if one of your goals was to increase organic traffic, you’ll want to report on the number of visits to your site from organic search. You also may want to report on related metrics, such as the number of keyword rankings, the number of leads from organic traffic, or onsite engagement of leads from organic traffic. As you create your analytics reports, make it a habit to look back at reports from previous months to compare the data so you can see the progress you’re making toward your goals. If you see that the numbers aren’t moving in the right direction after a few months, it might be time to sit down with your team to make some changes to your goals and overall content strategy. Helpful Tool: We've prepared this Content Marketing ROI Cheat Sheet to help you keep track of which KPIs to measure! Creating a content strategy takes quite a bit of work upfront, and it requires input from every department in your company. And while it may seem like an overwhelming task to complete all these steps, you’ve got this. Taking the time to create your personas, define your brand voice and tone, and set up a documented content strategy is well worth the effort. Not only will this documented strategy serve as your roadmap for moving forward, it also ensures that as you start creating content, everyone on your team is all on the same page. By following the steps above and keeping your eye on the end goal, your business will be on its way to content marketing success.